RE/MAX Coast and Country is a privately owned franchise division of RE/MAX International. Based in Brookings-Harbor, Oregon, ourteamspecializes in the highly sought-after Southern Oregon coast. RE/MAX Coast and Country’s slogan is “Achieving success one client at a time.” This aptly captures our approach of providing each and every one of clients with dedicated personalized service to match theirunique goals and needs. Our team members at RE/MAX Coast and Country are experts in the Southern Oregon real estate market. The team combines sound reasoning brought about by years of experience in real estate with extensive knowledge of the local community and cutting-edge technology provided by one of the nation’s largest real estate companies. The RE/MAX organization was created by top real estate professionals. And unlike its competitors, the company’s foundingleadership team remains intact to this day. Veryfew companies with a worldwide presence can say the same. RE/MAX is the No. 1 residential real estate network in the country, and is a leading industry force worldwide. The RE/MAX name is recognized and respected by 9 out of 10 Americans, and the firm’s red, white and blue hot-air balloon logo has become a popular symbol of real estate excellence and leadership. RE/MAX’s over 30 years of success are predicated in part on the above-average tenure of its associates and their ability to add special knowledge and experience to the firm. The collaborative work between the firm and its associates has propelled the company to unprecedented heights. RE/MAX International now provides real estate services to more than 50 million people in North America and 63 other countries, with expansion into Africa, Asia, Australia, the Caribbean, Central America, Europe, Mexico, New Zealand and South America. RE/MAX Coast and Country was founded by Marie Curtis, the firm’s principal broker. Marie’s personal journey as a property investor in the Northern California, Brookings-Harbor and Gold Beach areas, and her extensive travel and successful business experiences, have given her a unique perspective on the real estate industry. Marie’s drive, motivation, and passion for her career have taken her to a consistent multimillion-dollar producer status. On several occasions, she has been recognized and awarded by her community as Top Producer, and has consistently ranked among the top 5% real estate professionals in Curry County. 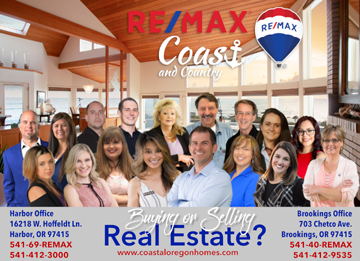 As a member of RE/MAX International, RE/MAX Coast and Country guarantees stability and access to top-notch real estate marketing resources, as well as adherence to the highest standards of ethics. Along with homegrown knowledge of the area and commitment to excellence, this has set this team of Brookings Realtors above the crowd, providing unrivaled resources at your disposal. Your real estate investments are too precious to gamble on anything less than the best professional guidance. Call RE/MAX Coast and Country now to find out how we can help you close that all-important deal.